One of the rarest Roman coins ever found has gone on display. 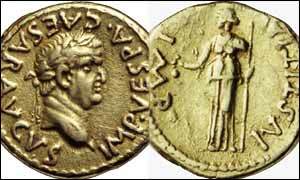 Only one other example exists of the gold coin, which was struck in AD 70 and features the head of Emperor Vespasian. It was originally discovered in Finstock, near Witney in Oxfordshire, in the middle of the nineteenth century and given to a Worcester woman. One of her descendants donated it to the Ashmolean museum in Oxford last year, which unveiled its new treasure on Tuesday. The museum curators say only one other coin of this type has been found in the world, near Didcot in Oxfordshire. Dr Chris Howgego, curator of roman coins at the Ashmolean, said: "It is a splendid looking sparkling gold coin with a very striking protrait of the Emperor Vespasion on one side and a figure of justice on the other. "One of the most interesting things about this is the coin was not made in Britain. "Nor was it made in Rome where most Roman coins were made, but actually in Judea."